UFC mega-star Conor McGregor reveals what it'll take for him to take a co-main event slot on a UFC pay-per-view (PPV). “I’m ready to fight,” McGregor said. “I’ve said that, no problem. If the UFC wants me to slide into that co-main event and help, what that is, me sliding into the co-main event, it’s boosting their brand over fighter rhetoric that they have. McGregor was previously linked to talks of a possible fight with fan-favorite Donald “Cowboy” Cerrone. However, the negotiations broke down after the UFC reportedly wanted McGregor to fight in a co-main event role. Now, the likelihood of McGregor fighting Cerrone next seems slim. However, the former “Champ Champ” would like to get back into action soon. He recently admitted he’s aiming for a July return to the Octagon. McGregor hasn’t competed since October. He was submitted in the fourth round by Khabib Nurmagomedov at UFC 229. After the bout, a team vs. team brawl broke out, resulting in suspensions and fines for everyone involved. McGregor’s suspension is up in early April. Unfortunately, “Mystic Mac” hasn’t been able to stay out of trouble away from the UFC. He was recently arrested in Miami for breaking and stealing a fan’s cell phone. 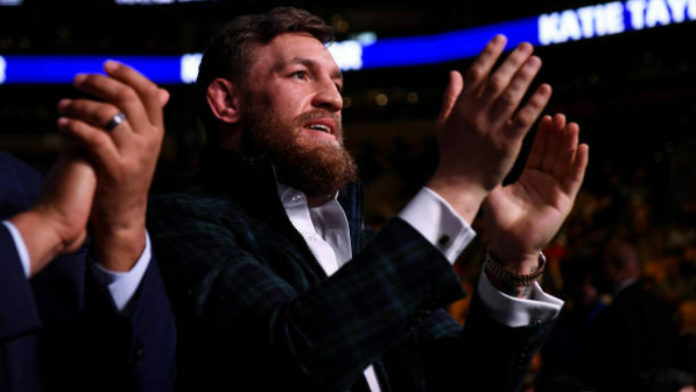 What do you think about McGregor saying he’d co-main event a UFC PPV for company shares?